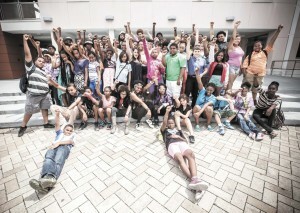 ReThink Youth Empowerment Camp (Louisiana Weekly. July 2014). On Thursday July 24, Rethink’s Summer Leadership Institute celebrated a “day of action” to call for youth empowerment, and to show off the various projects the campers completed this summer. Since 2006, Rethink’s summer program—held this year at Wilson Community Center—has gathered to raise awareness and consciousness around an issue of the students’ choosing. The five-week camps first began post Katrina. “It was designed to help the kids understand what had just happened to them,” says Rethink executive director Karen Marshall, who moved to New Orleans from Boston last October. “It was also to let the kids have a say in the way the new schools would be restructured.” Rethink became a year-round non-profit program in 2008. This year’s theme was freedom, and also oppression, be that systemic or simple bullying. The “Rethinkers,” as the students were called, consisted of 46 registered middle schoolers between the ages of ten and 14. About eight high school students ages 15 to 22–calling themselves the Ujima Collective—effectively facilitated the younger students and led them in group discussions, art projects and other activities. The older kids essentially ran the camp, under the watchful eye of several adults.